I’m not usually the biggest fan of Miss Marple – I much prefer Poirot who actually gets off his arse and does things instead of sitting there and piping up at the end that he knew it all along. Regardless, I really enjoyed The Body in the Library. It’s clever, amusing and much more interesting than some of the others. It’s seven in the morning. The Bantrys wake to find the body of a young woman in their library. She is wearing evening dress and heavy make-up, which is now smeared across her cheeks. But who is she? How did she get there? And what is the connection with another dead girl, whose charred remains are later discovered in an abandoned quarry? The respectable Bantrys invite Miss Marple to solve the mystery! before tongues start to wag. To be honest, I think this may be the only Miss Marple book I’ve been impressed with. I love Poirot more than life itself, but Miss Marple just tends to sit there knitting while making obscure little remarks. The Body in the Library is completely different though – she takes an active role in investigations, while still comparing the victim to her sister’s neighbour’s maid’s cat or something similar. I love how all the characters keep mentioning how the whole scandal ‘seems like something from a mystery novel!’ Ms. Christie states in the introduction how she wanted to take a mystery novel cliche (the body in the library, shockingly) and turn it on it’s head. As a result, all the characters seem to be in on the joke and it’s hilarious. 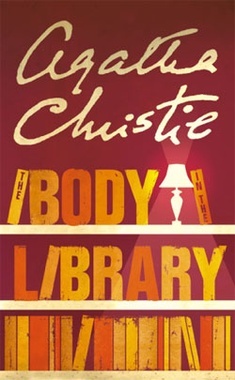 In an earlier book, someboy states that Ariadne Oliver is the author of a book called ‘The Body in the Library,’ which apparently Ms. Christie ended up actually writing! Colonel Melchett looked as though he were about to return a short answer, but Superintendent Harper intervened. He spoke benignly and heartily. Aww. That actually made me smile. I think that’s the main reason I love the book though – Agatha Christie wrote it like she’s poking fun at herself and all the author mystery authors of her time. And naturally the plot is as ingenious as ever – twists, red herrings, accused innocents and unexpected accomplices! I’ve always understood why Ms Christie is known as the Queen of Crime, but this book really confirms it for me. These books are always really hard to review, so excuse the brevity – I can’t talk about the plot without giving the twists away and the rest of it is very dialogue-based. Just trust me, and choose this one if you’re going to read a Marple. I love the review! I've actually never read an Agatha Christie book before, but I've watched a few of the TV movies. I did get the recommendation to try And Then There Were None though, so I'm definitely looking forward to giving it a try. And I'll also have to add this to my wishlist. I absolutely love the sound of it! Great review! I really have to get back to reading Agatha Christie. I haven't read The Body In the Library. @Rebecca – Please, please, PLEASE read And Then There Were None! It's my ultimate favourite Agatha Christie book, although it doesn't have Poirot or Miss Marple. It's just so clever! "…she just seems to sit there knitting while making obscure little remarks"
But then, she's all like "Ha – I'm a genius old lady and learned everything despite not having done anything". So maybe I should go with Poirot? I like his moustache-y charm a bit more, I think. Actually, I've been thinking I might go all retro and try Sherlock Holmes. I know that really that bears no relation to your review of this book but it popped in to my head so I thought I'd share in any case! @LIB – Ahh, no. The one I was thinking of was An Appointment With Death, I think. That's my favourite Poirot one. Ooh, for Murder on the Orient Express – I never saw the ending of THAT coming! And hey, it's famous for a reason. Exactly! In this book, at one point she actually says that she knows who's going to be murdered next… but then he dies anyway because she doesn't DO anything! Have you not read Sherlock Holmes already? I like them I really do, but some are a bit over-rated. And for the love of God, don't start with the Hound of the Baskerbilles! My favourite is a short story called the Speckled Band. Erm…no Q_Q That is quite bad, isn't it? And the first ebook that I bought for my eReader about a year and a bit ago was the whole Sherlock Holmes shebang so, once again, I have no excuse! I promise I definitely won't start there – I might go for a smattering of short stories first (despite my inner geek crying out for chronological order!) to warm up. The Speckled Band sounds as good as any to me! I can't believe Miss Marple keeps people's impending deaths a secret but that other people still want her around?! I think I'm put off her all over again! An old lady that doubles as a death omen would not be a welcome guest in my house, that's for sure. I'm not risking it, anyway, so it's going to be whichever of An Appointment With Death or Murder on the Orient Express comes into the library first when I'm at a loose end! Haha, she's not really a death omen. It justs seems like it never really occurs to her that she might want to tell someone. She seems very innocent, whereas Poirot just pretty much hates everyone. My kinda guy!